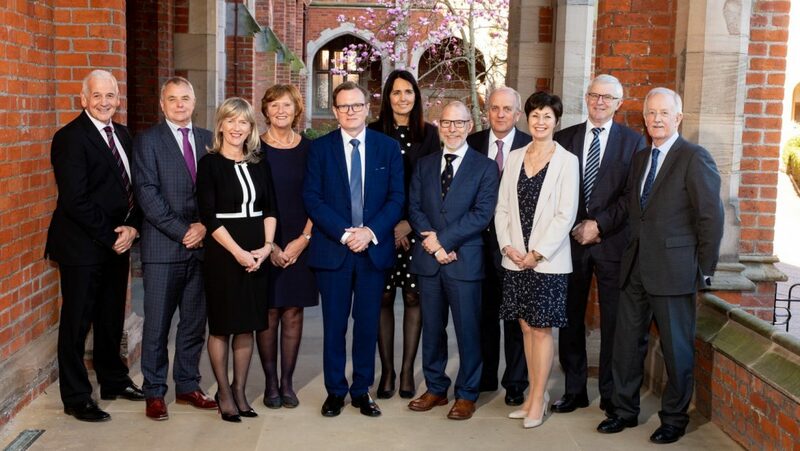 Queen’s University and the Presidents of Royal Medical Colleges in Ireland, England and Scotland, hosted more than 150 doctors from Ireland, England and Scotland (on 26 February, 2019) to discuss the wide range of challenges that Brexit will create for the health services in these jurisdictions. The Presidents of Royal Medical Colleges in Ireland, England and Scotland issued a stark warning to politicians that protecting access to cross-border healthcare and patient safety must be a top priority as Brexit nears. Convened by Professor Mary Horgan (pictured above, 3rd from left), President of the Royal College of Physicians of Ireland, this meeting provided a forum for doctors working at the frontline in neighbouring countries to share their concerns and highlight challenges as Brexit draws nearer. “Brexit, particularly a ‘no deal’ Brexit, has the potential to throw up serious challenges in how we deliver healthcare, particularly in border areas,” Professor Horgan said. She continued: “These are exceptional and uncertain times that will place greater strains on already highly pressurised health services. Politicians must stay focussed on protecting patient safety, access to cross-border healthcare and address other issues that can affect the recruitment and retention of doctors in our health services. President of the Royal College of Physicians of Edinburgh, Professor Derek Bell OBE (2nd from left), said: “It is right and proper that the Royal College of Physicians of Edinburgh – in conjunction with our sister Colleges – discusses and plans for major issues such as Brexit, which has the potential to have a major impact on all staff working in the NHS. “It is our wish – and I am sure that I speak for all of our Members and Fellows – that the practical effects of Brexit are kept as far from the frontline of healthcare delivery as possible, so that both staff and patients can continue to work to deliver the best care. Professor Jackie Taylor (3rd from right), President of the Royal College of Physicians and Surgeons of Glasgow said: “With only thirty-two days before the UK leaves the EU, managing the Brexit process remains the biggest immediate challenge to the NHS. Professor Andrew Goddard, President, Royal College of Physicians of London said: “As Brexit draws closer, clinical leadership has never been so important. The royal colleges will continue to work together to make sure that patient safety is at the centre of Brexit planning. “We want the government to work with the EU, the NHS and health organisations to put patients at the heart of their negotiations because this ongoing uncertainty is causing a real challenge to NHS workforce planning, the supply of medicines, and medical research. To find out about supporting medical research at Queen’s visit the Development and Alumni Relations Office website or contact Teresa Sloan, Head of Health Fundraising, telephone +44 (0)28 9097 5394. Medical queries arising out of this news story should be discussed with a GP/consultant and not with DARO staff. Media enquiries to Queen’s Communications Office on telephone: +44 (0)28 9097 5292.